He’s widely known for starting and scaling the experience design team at MailChimp, a place he called home for more than eight years. His classic book, Designing for Emotion, just reached its 5th publishing anniversary, but its principles are more valid today than ever before – and Aarron’s used them to improve the experience of companies and organizations ranging from American Express, Wells Fargo and Typeform to, yes, The White House. Most recently, Aarron’s joined InVision, a prototyping, collaboration and workflow platform for designers, as VP of Design Education. There, he’s developing best practices to guide the software industry forward. Aarron joined me on the podcast to chat about the why your design team needs soft skills, the role of design values and the importance of designing for empathy and emotion. If you like what you hear, check out more episodes of our podcast. You can subscribe on iTunes or grab the RSS feed. Academia and field experience both play a role in design education. Those who know the tools of the trade, but can also think deeply about the meaning of the product and the strategy are in a strong position for leadership. When it comes to making design hires, hone on a candidate’s soft skills. How do they communicate? Are they adaptable? Have they found creative solutions in the past? Cross-functional teams can be an asset, but you can’t leave designers on an island where, for example, engineers outnumber them 6:1. Strong design values and regular feedback from fellow designers are critical culture components, especially in this structure. Designers at startups often optimize for speed early in the design process, when they should be doing so toward end. If you don’t slow down to truly understand your users’ problems, there won’t be time for success. A great product accounts for a buyer’s emotional decisions. When several products get the job done, which one feels the best in doing it? Adam Risman: Aarron, welcome to the show. Most of our listeners will know you through the UX work and incredible team you built at MailChimp. But before we get to that, I want to ask about your unique new role at InVision. What does that entail and why were you so excited about the opportunity? Aarron Walter: VP of Design Education is a pretty unique thing for our company and the software industry, but because we make software for designers, we want to see design succeed throughout our industry. We definitely see a big trend happening right now where our tools are starting to change the way that we design, which helps our medium become a lot more sophisticated, and we see consumers becoming a lot more sophisticated in how they use software. Everybody’s got a phone, an iPad, a laptop – we’re connected all the time. It used to be that we would buy these books like iOS for Dummies or Word for Dummies because we were dummies, we weren’t very sophisticated with software. But now software is in every aspect of our life. We know what a good experience is and what a bad experience is. We vote with our home screens on what we’re going to use. We see big companies like IBM, which is this Fortune 10 company with tens of thousands of employees around the world, hiring something like 2,000 designers. They’re investing heavily in design. We see Google, which is a company that’s really prided itself on its engineering prowess, transforming into a design-focused company. We see this happening in Salesforce and many other companies where design is becoming a high priority, because consumers know what a good experience is, and that’s what we’re selling now. It’s not a feature matrix, it’s the experience. Our tools and the environment for the software, it’s really changing the way we work. So why is design education important? At InVision we’re not just selling the platform where people design and collaborate on design, but we’re also helping designers and all the teams that they collaborate with, from executives, engineers and product managers to lawyers and support teams. All those people come together around design. We want to see design elevate across our industry and that’s a big part of what my team is doing. We’re helping companies learn how to do design better. Adam: The role sounds like a mix between two previous careers of yours: your time leading the team at MailChimp, and the time you spent in academia as a Design Professor prior to that. There’s a bit of a debate in the design industry around certification and degrees. Your friend Jared Spool, who just launched Center Centre earlier this year, has been really vocal about balancing field experience with academic learning. Why are we seeing this imbalance? Has academia simply been slow to catch up to technology? Aarron: There’s always going to be a bit of imbalance with academia because it’s a medium that is slow to change, and that’s one of its virtues. From where we stand in technology and design, we change fast, and we see that as our virtue. Depending on where you stand, each virtue can become a vice, but academia, it just can’t keep up with how fast technology is changing and that’s okay. It’s really good at delivering this connected, liberal arts education where students get perspective on a lot of different domains and different subjects. That’s an important part of feeding creativity – that creativity is about connecting the disconnected, finding new ideas by exploring different territory. is about connecting the disconnected. Academia is still very important and very relevant. It’s important to study things like philosophy, religion, mathematics, biology and art. They feel unrelated to what we’re doing, but over the years I’ve hired so many people that have those sorts of backgrounds. They didn’t necessarily have a technology background or a even a design background, but they were able to level up those skills to augment a really solid foundation in liberal arts. I’ve also hired some people that were college dropouts. They made it about a year and said, “You know what? This isn’t for me, I’ve got to be making things with my hands.” They went out, got a job in an agency, worked with a bunch of clients, worked really hard and learned on the job. That’s okay too. It’s a different way of coming to an understanding of what you’re doing, but I don’t think it’s wrong. One isn’t better than the other. Jared is essentially suggesting a balance. If you’re entirely academic, but you have not actually practiced or applied those ivory tower ideas, if you haven’t applied those to something practical, then is that very useful? Conversely, if you only know the tools of the trade, can you think very deeply about the meaning of the product and the strategy? Can you think very high level? Maybe not. A balance between those two puts you in a really strong position to be a leader in design and technology, versus just a technician. Adam: You mentioned hiring, something you did quite a bit of at MailChimp as you scaled that team. At early-stage start ups where you’re hiring the first few designers people skills and chemistry are so important. What are the qualities beyond the resume page that you would look for in designers? Aarron: I wrote about a post about this a while back, “Hire People Not Skills”. The typical way we do hiring in so many different businesses is we list out the skills you need to be able to do the job, but stop for a minute and think of if you’ve fired a person or you’ve known people in your organization that have been fired. Was it because they’re HTML wasn’t good or their designs weren’t up to par? Maybe, but most of the time it’s the soft skills that get people booted. When we’re hiring we need to focus on the soft skills. How well does someone communicate? How do they collaborate with other people? Are they adaptable, or do they have to have things just right to feel like they can do good work? We can investigate these soft skills by basically making time with people to learn more about who they are as a person. Learn about what their interests are, if they’ve got side projects that are interesting, and how they’re jumping into these side projects and solving problems. There’s some folks I’ve interviewed who are working on a side project not because anyone asked it of them, and they were doing it nights and weekends. This showed a person with passion. They didn’t have the right things to be able to build what they wanted. They were figuring out solutions in a creative way, and that stuff is really compelling to me. I would hire off of that versus a resume any day. A lot of times I would spend an entire day with a person, getting them in front of lots of different people, making time for them to hang out over coffee or lunch, because it’s really hard to fake your way through a day’s worth of conversations. You can fake your way through a 30-minute or one-hour interview and really put your best foot forward. Time is definitely an important part of the hiring process. Adam: We’re seeing a lot of companies that, as they begin to scale, are embedding designers alongside engineers and product managers on actual product teams. How can designers in these settings avoid the feeling of isolation and champion smaller details to those may overlook or undervalue them? Those soft skills really come into play there. Aarron: There are definitely some challenges with cross-functional teams, but they’re good on so many levels that help us to better understand our colleagues and heir domain better, which creates empathy and respect. I’m a big believer that organizational design heavily influences product design. If you’ve got the wrong organizational design for the time, the stage your company is in, it’s really hard to make your best work. But there are situations where designers are solo in a cross-functional team, where they’re outnumbered by engineers by six to one. It’s going to be a tall order to convince anyone. Even if you’re a great communicator and you’re humble and collaborative, it puts you at a great disadvantage. Feedback is the lifeblood of a healthy design team. It’s better if we can design those situations and structure our teams so designers are never on an island. Either they have at least one other designer working with them on that project or if resources are thin, a designer who might be on a different team but works with you like eight hours a week. Because if you’re working as a designer on a problem, you can get stuck. Then you end up spinning your wheels because you’re not getting feedback, and feedback is the lifeblood of a healthy design team and design practice. Designers who are on their own, they feel like their careers stagnate and they’re not growing. Ask any designer what they want in their dream job. They don’t say, “I want $50,000 more per year,” or, “I want better health care.” They say, “I want a place where I can learn and grow.” If you’re the only designer on a team, you’re just not going to get that. You’re not going to grow and the company is going to have a churn problem – turnover where people are going to leave looking for a more healthy situation. So not putting designers on an island is important. I think a designer should see [a cross-functional team] as an opportunity to learn from other folks. But have a strong set of values that guide design so it doesn’t feel like, “okay, we’re changing the color of this button again? Why is this meaningful”? Because designers can get caught noodling. This is another problem. If you’re left to your own devices for too long, you lose track of what’s really meaningful. Having design values, we see this in a number of companies. They’re coming up with design systems that are not just about design patterns and what do buttons and forms look like, but also, why did we do this? We’ll use IBM as an example. They’ve got a design system that draws upon the history of the company and the brand. The way that they animate relates to the machines from the ’60s and the ’70s. There’s this rich history that’s embedded in the design concepts they’re producing, and that can help a designer greatly. They can stop talking just about style and start talking about the values. Engineers have certain values, very quantitative values of like how many bugs were produced in this last release, or what’s the time to ship. These are not necessarily the values that should guide design. 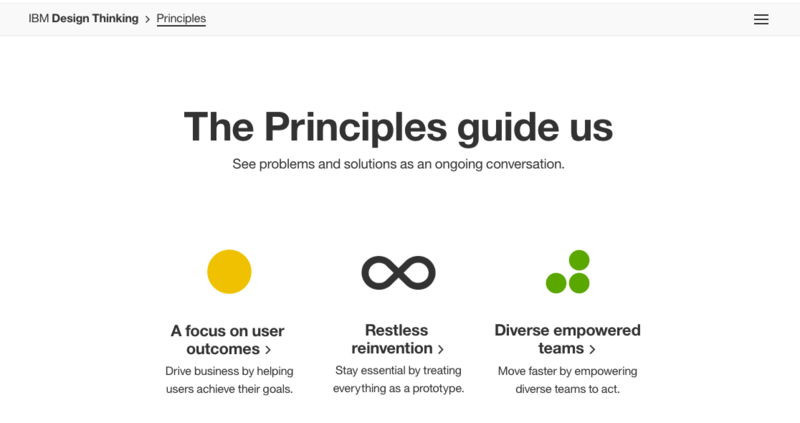 Design is qualitative, so designers need values to guide them. Adam: As a company grows, there are new business hurdles to navigate and more decision makers coming into the fold. As someone who’s ridden that growth curve before at MailChimp, what can early-stage design leaders be doing to help prepare for those challenges? Aarron: It’s about recognizing where you are and how things will change. 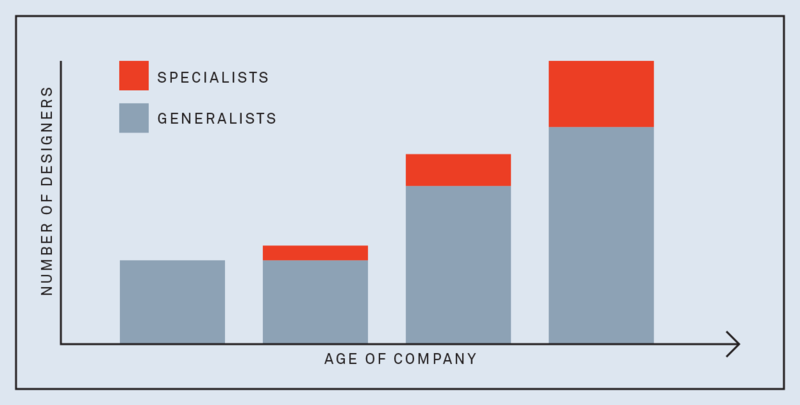 When you’re in that early stage, you will tend to hire for a diverse set of skills. Someone that could do a lot of things, but they’re not necessarily a specialist, because you don’t have very many people on staff and have to get all these things done. Versatility is advantageous early on. As you grow, those versatile people start to specialize and find specific pockets where they can contribute to the company or the team. Then hiring shifts. You need to hire more specialists, so knowing early on that you’re going to have your values for hiring and that how you’ll organize the team will change, that’s important. Recognizing that your current team structure should work for now, but doesn’t have to work for perpetuity. In fact, it should change. Early on it might be best to have design separate from engineering, but as you grow maybe it needs to be more decentralized. It’s about recognizing the size of the company, where the product is, and how mature the product is. All of these things they need to be considered along the way. Adam: You’re very passionate about the idea of designing for empathy, a concept that it’s important for companies at all stages – yet is difficult to execute for different reasons at different stages. Early on you can get caught up in the rush of shipping as quickly as possible. As you reach scale and grow, designers can become more insulated. How do you advise that designers break out of their bubble and experience the stress of real users at an early stage? And what’s the key to maintaining that empathetic culture at scale? Aarron: It’s a matter of stating clearly that this is a value to us. Recognizing that if we optimize for speed at the beginning of a product, we spend a lot of time and resources making the thing, we ship it and the first impression with customers is negative because we didn’t stop and research the market – actually talk to our potential customers and basically consider the problem from all angles – we lose that first impression opportunity. Maybe people will come back. Will people download a mobile app again? Probably not. If it wasn’t right out of the gate, they’re not coming back to you. If you don’t have time to talk to your customers, you don’t have time for success. In terms of designing for empathy and human connection, this is something that’s very familiar in architecture, industrial design, graphic design, all these disciplines that have been around for a long time. They recognize that they’re designing not just to be functional, but to be pleasing and attractive and meaningful. We have hundreds of years of experience with these mediums where we see this value. Look at automotive design for example, a Honda HR-V. It’s a very practical, simple car. It’s economic. It gets good gas mileage, you can do a lot with it. It’s $19,000. 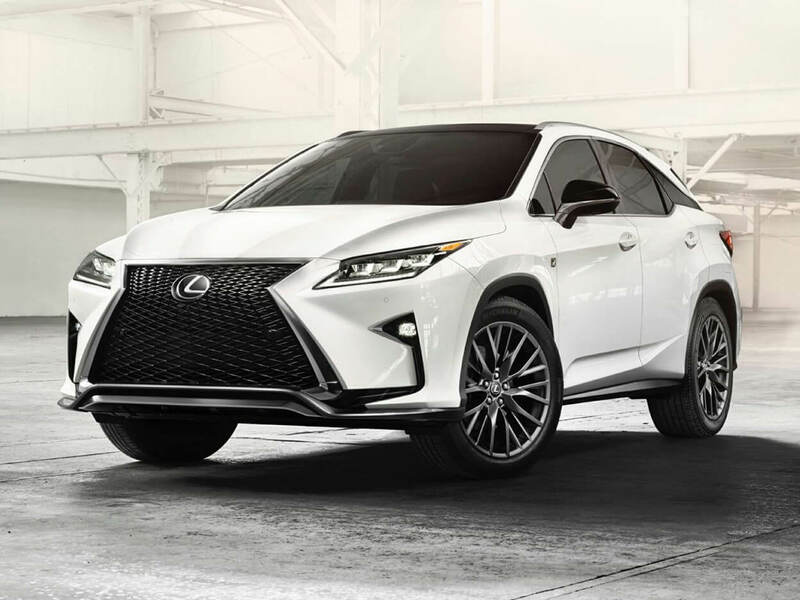 A Lexus RX is $64,000. It’s four times as much money as a Honda HR-V, but it basically does the same thing. Why do we spend four times as much money? We feel this sense of status and luxury. A Lexus RX-350 provides a sense of status and luxury that’s reflected in the price. There are all sorts of emotional reasons why we would make that purchase decision. We know this from other disciplines. In software, we’re not dealing with material goods, but we are dealing with the experience. Creating a user experience that’s not just about I got my work done, but did that feel good to get my work done? Do I want to go back here? Do I want to tell friends about this? All of these things are really powerful if we stop and carefully consider connecting with emotion, not just the quantitative things. Adam: When you talk about how it’s crazy not to prioritize this stuff early, is part of the problem this fail fast mantra that’s often cited in the software industry? Aarron: I’m not a huge fan of that idea. The surest way to fail fast is to not talk to your customers or investigate the market or put yourself in their shoes. The idea is really just a phrase that’s misinterpreted. It’s about learning fast. It’s about making things and trying things without the fear of doing it wrong. That is good to a certain degree, but it can lead us to optimize in the wrong place, where we get speed early on. Really we need speed at the end. We need to design and build faster, but take more time to solve the problem. A friend of mine, Laura Martini, summed this up in a simple quote. She said, “You win a race at the finish line, not at the starting blocks.”Fail fast to me is often interpreted in the Valley as being fast out of the gate, which is dangerous. Adam: Speaking of empathy, that’s a big component of a book that you put out about five years ago, Designing for Emotion. If you were to go back today and say, release a second edition, what needs to be said or covered that wasn’t then? What would you accentuate more? Aarron: Designing for Emotion, just the idea of thinking from the customer’s perspective, identifying the emotional context of the moment, all that stuff is evergreen. What’s not evergreen is the examples of how that’s changing our industry. To bring our conversation full circle, design is rising to the top in our industry. It’s not a nice-to-have thing. We’re not decorating. It’s a central part of the user experience, and I see a lot more examples of designing for emotion in our industry these days. I don’t think that the concepts are necessarily off. It’s just a matter of finding ways to change our mindset in terms of how our teams work and where we make space for this. Adam: One type of design experience we can’t seem to hear enough about these days is conversational design and chatbots. The problem with trends like this is that creators lose sight of that empathy and have the urge to implement them everywhere, rather than where they’re actually more useful, quicker, or easier. How should the idea of designing for empathy or emotion better be applied in this space? Aarron: Chatbots are really interesting for a number of reasons. If you’re interacting via SMS, for example, the fact that you don’t have to log in is huge. Just to have persistent connection to data or a service, that’s really compelling and exciting. When you see the uncanny valley of a chatbot is where that designing for emotion part breaks that. Where a chatbot is trying so desperately to emulate the human experience, but we see that it’s just a bot, that it’s fake. It just said the same thing to me two times over. That feels really weird and creepy, like it’s human, but it’s not human. I’d almost rather that the chatbot be more transparently bot like – to be succinct and not try to inject so much flourish to give the perception that it’s human. To me the exciting part of chatbots is not the conversational piece because that’s actually pretty clunky. It’s that the service becomes so succinct and so accessible all the time. Adam: It’s an exciting time to be a product designer, but there’s also a lot of pressure. Has design really become the make or break differentiator for new products or services entering a competitive marketplace? Aarron: Absolutely. Experience is everything. At this point it’s so easy to spin up servers and build on frameworks and make a good product that does a lot of things. But if it doesn’t do those things well, if it doesn’t do those thing in a way that is easy, enjoyable and like feels good, it’s hard to stand out in the market because everyone has access to all of these tools. It’s easy to make something that’s good, it’s still really hard to make something that’s great. Adam: Aarron, I think we’ll leave it there. Thanks again for joining us today and we’ll catch up with you soon. Aarron: My pleasure. Take care.